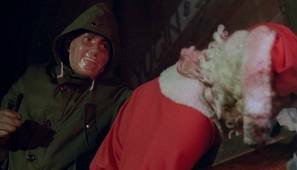 A murderer is running loose through the streets of London, hunting down men dressed as Santa and killing them all in different, and extremely violent, fashions. Inspector Harris has decided to take on the unenviable task of tracking down the psychopath, but he’s going to have his work cut out for him. Only the suspicious reporter, Giles, seems to offer the Inspector any promising leads.